The RSS Formula Hybrid (S1 Version) – Purchase here : FtF data.acd here – rename original data.acd then replace with this file in “rss_formula_hybrid_2018_s1” car folder. Stunningly beautiful car with very sophisticated modelling. If we don’t use this car next season, we WILL use it in the New Year. 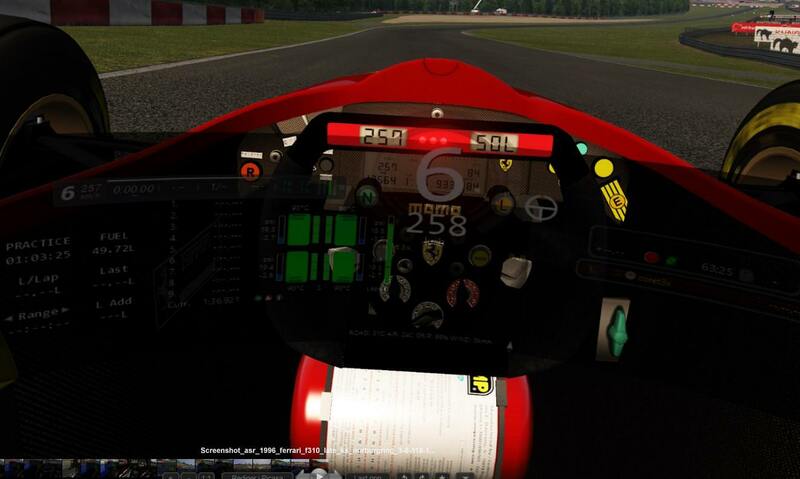 The ASR Ferrari F310 (LS Version) – Download here : FtF data.acd here – rename original data.acd then replace with this file in “asr_1996_ferrari_f310_late” car folder. Accelerate/brake/steer, good old-fashioned driving with no electronic aids. Kunos’ F2004 Purchase here : FtF data.acd here rename original data.acd then replace with this file in “ks_ferrari_2004” car folder. Best F1 car Kunos has made. I would plan to follow the F1 calendar as closely as possible with the RSS car and ditch all the Tilke tracks in favour of Zandvoort, Magny Cours etc with the F310. The F2004 would sit somewhere in-between the two scenarios. RSS data.acd – added missing compounds re-jigging temps slightly, fixed DRS, added some grip to get closer to real F1 laptimes, made brakes less sensitive and made correct pressures 100% accessible. Optimal running 26psi, HS: 80-105 degs, US: 85-110, SS: 90-115, S: 95-120, M: 100-125, H: 105-130, SH: 110-135. F2004 – Fixed kerb instability, increased traction so we could use without t/c and made turn-in a bit sharper. Optimal running 23psi, S: 70-110 degs, M: 75-110, H: 80-110. F310 – Fixed kerb instability, locked neutral from accidental downshift, made default setup less understeery. Optimal running – 22psi, 90 degs both compounds. All cars have pit lane times (tyres/repairs/refuelling) reduced. Have fun practising and feel free to post any comments about the cars here. I am away for a week, so will change the track when I get back and maybe we can meet in chatroom then to discuss cars, any changes etc. RSS Formula Hybrid: Remember to lower Various > Steer assist to like 40 or lower, or else the FFB is really bad. F310: (if you drive without player model) i managed to identify the texture file for the F310 fire extinguisher as it glows a lot in VR (https://i.imgur.com/tDhJVf5.jpg). the file is 96_estintore.dds and I have made a black version of it so you can download it here: https://drive.google.com/file/d/1y5H81XcCJ7C5GCXeyPusTUotxUBCMDI7/view?usp=sharing Just copy the file to all skin subfolders example 1a_mschumacher_t\96_estintore.dds It still glows a bit but not that annoying. Can the extinguisher be removed – its not an essential feature. If you have the driver shown he only sticks his legs straight through it anyway. Had a good go of all three now. The F310 is a fun car to drive and a change from the modern cars. I’m not a fan of this version of F2004 though. Traction is overdone – even going back to the original traction and using TC would be better. At least the braking might be more edgy. RSS car is interesting. I reckon fix the F2004, then run all three cars in the next three seasons in historical order. although i find interesting the idea of 3 cars in next 3 seasons, we might end being always “outdated”. it might be 2 leagues, one legacy and one on the edge, but i don’t like loosing focus from one first league. but if for some reason the rss wins i would really love to have also an legacy or legendary league with f310, i guess there’s room for both. Haha, I only said it was interesting. We’ll have a chat to see what folk really want to do. Maybe next summer we could do something starting with Lotus 49 and working through the ages though – 2 races per event. I’m planning a Summer break from now as I’m about to be partner running a Guest House and hope to be a bit busy then. Will sort when I get back at weekend. Can limit amount of t/c allowed with f2004. Was worth trying. F310 at Road America is brilliant. That combo is a league must. 4. Fuel rate adjusted so we could run races without refuelling and hence use Safety car. 1. Handling restored to its previous glory – low grip/traction from grooved tyres, huge power. 2. Traction control enabled, but limited effect. Level 1 (default & highest level) is equivalent to level 7 when we used it previously in league. If you try the F310 at Spa, raise the ride height! Today tried a bit the f2004 for a change, it looks quite good as well but was there really need for the traction control!? it looks quite stable without it, and when it’s stable for me, for others its a piece of cake :). As for the car the front tires looks a bit far ahead and looks a bit like driving a bus :) and that’s maybe the reason i like so much the f310 cause front tires are near to the steering wheel and you feel much more connected to the car, not like driving with a remote. I agree about the F2004. Should we race with the F2004 as it is then it doesn’t need TC, in my opinion. Watch out for sign-up post – coming soon. 1st race will be test race at Spa on 29th (2 weeks).